The CW announced that it’s renewing all four shows in its superhero lineup. That’s right, Arrow, Supergirl, DC’s Legends of Tomorrow, and The Flash are all returning again in 2017-2018. It’s not much of a surprise, but it’s still very exciting. 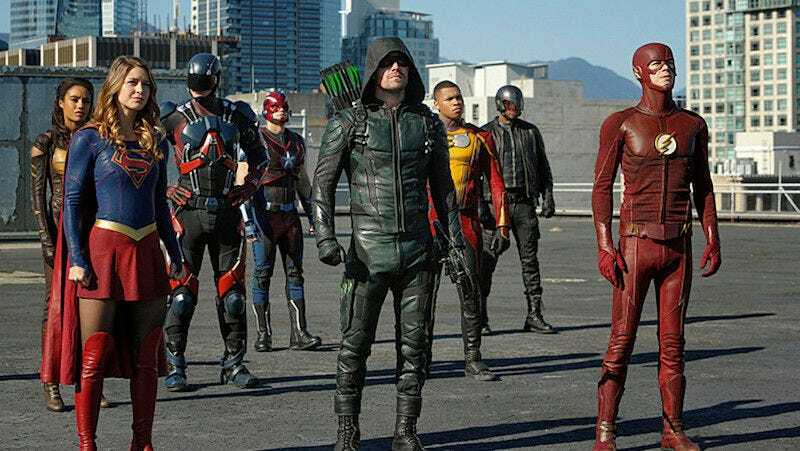 CW’s four superhero shows have created an awesome and fun television universe that shows how amazing the DC movies could be if they stopped taking themselves so seriously. It’s encouraging to see how the franchise has grown over the past year. Bringing Supergirl into the fold after the show got cancelled on CBS was exactly what it needed to go from good to great, and the forthcoming Supergirl/Flash musical crossover is basically the only thing keeping me alive right now. Bonus, we’ve gotten news that Constantine will get an animated series on CW Seed, which could mean more John Constantine crossovers in the “real world.” It’s a great time to be a DC fan—at least a TV-watching one, until Wonder Woman comes out anyway. The CW also announced that Golden Globe-winning series Crazy Ex-Girlfriend, Jane the Virgin, and Supernatural also got renewed for next season. Still missing from the list is The 100 and iZombie, although those might be announced later, because they’re midseason shows. iZombie showrunner Rob Thomas discussed how seasons 3 and 4 of the series will focus on zombie discrimination, so there are hopes it will be renewed. Clarification: While Thomas discussed plans for season 4 of iZombie, it doesn’t look to have been confirmed by CW. Apologies for the previous mistake.